Ok people — as IF you need another thing to do in your life… I KNOW! But I’m about to tell you about something that YOU HAVE TO DO. The kids went bananas today. BANANAS! And it was over NOTHING. Something so simple and fun. 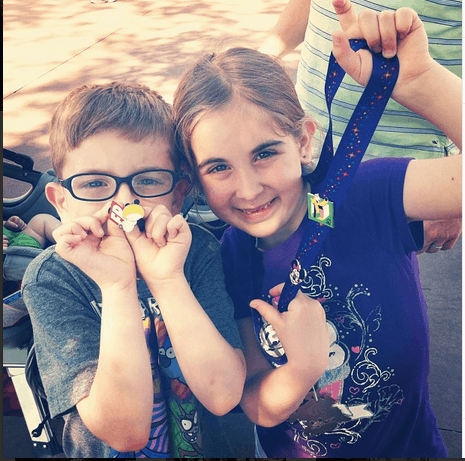 I’m talking – pin trading at Disney. Here’s my advice: hit up eBay and get yourself a starter kit. Buy a bunch of really cheap pins and bring then down with you during your next Disney trip. Then let the magic begin. The majority of the cast members around the parks all have pins to trade and your children can go up to all of them and do a little bartering. We started with about 10 each – I don’t think you need more than that. They spent the WHOLE DAY looking for people to trade with. Hollywood Studios was FILLED with cast members just ITCHING to trade. We ended up with some really cute ones too. In the end, I bought Natalie and Liam one pin each to remember this trip by – a Star Wars one for Liam and an Everest Roller Coaster one for Natalie. They both wear their lanyards proudly! Do you pin trade while at Disney? Have any tips you’d like to share?? ?